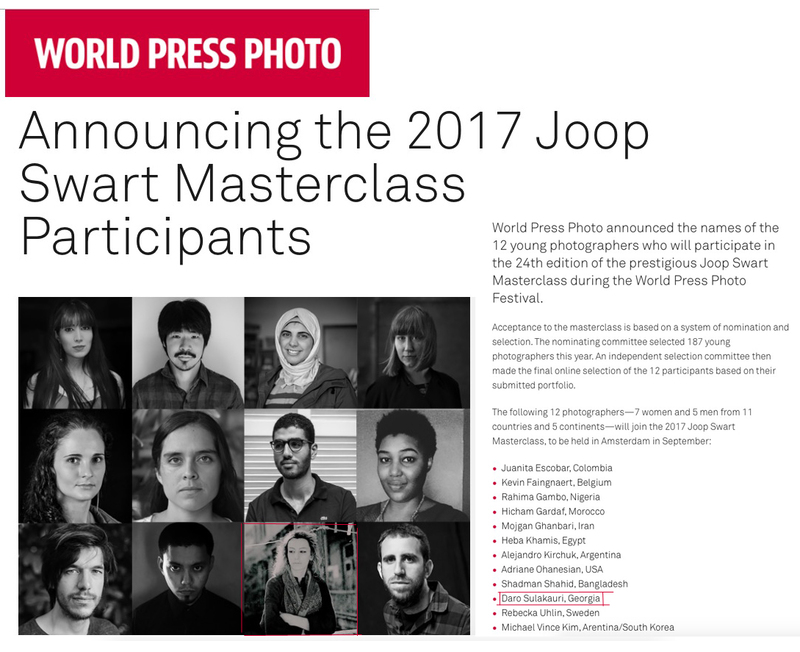 The World Press Photo Foundation is pleased to announce the names of the 12 young photographers who will participate in the 24th edition of the prestigious Joop Swart Masterclass. 2006 Graduated from ICP, School of International Center of Photography, in Documentary Photojournalism Program. New York City, U.S.A.
2008 Graduated from Department of the Cinematography of the Tbilisi State University in Cinematography. 2003 Graduated from School of Photography "Sepia", Tbilisi, Georgia. 2017 Honorable Mention in Tokyo International Awards, (TIFA). 2016 Winner of EU Prize for Journalism in Best Photo. 2015 Winner of Human Right House (HRH) for Best Portrait, LONDON. 2013 Second Place for Best Picture , SCI (Civil Society Institute) Photojournalist who work on social themes. 2013Winner of the Other Hundred. 2011 PDN’s 30 emerging photographers to watch. 2011 Winner for Best Story , SCI (Civil Society Institute) Photojournalist who work on social themes. 2009 2nd Place in Young Photographer in the Caucasus Award — Magnum Foundation. Magnum Photos. 2009 Winner of Photo Competition "Kolga". Tbilisi, Georgia. 2008 Finalist & Honorable Mention for PhotoWeek DC Photo Contest. Washington D.C.
2006 TPW Focus on Monferrato Scholarship. Monferrato, Italy. 2003 Certificate of recognition for Photojournalism, IREX, Media Innovations Program. Tbilisi, Georgia. 2006 Winner of the Nikon Campus Monthly Challenge student photography contest. N.Y. U.S.A.
2006 John & Marie Phillips Scholarship. New York City, U.S.A.
2005 Winner of the British Council Photo Contest."Road". Tbilisi, Georgia. 2018 Group Exhibition “Shared Waters”, Chai Khana. Yerevan, Armenia. 2018 Visa Pour L’image, Canon Female Photographers , “The Women’s eye”, Perpignan, France. 2018 Group Exhibition, “Photographic Art from Georgia”, Frankfurt Book Fair, Germany. 2018 Solo Exhibition, Lechaki”, Erti Gallery. Tbilisi, Georgia. 2018 Solo Exhibition, “Changing Horizons”, Tbilisi Kolga Photo Festival. 2018 Solo Exhibition, “Changing Horizons”, Asanbay Center. Kyrgyzstan, Bishkek. 2017 Solo Exhibition, “The Black Gold”. Odessa Batumi Photo Days. Georgia. 2016 Group Exhibition in Rooms Hotel, Tbilisi, Georgia. 2015 Personal Exhibition "Double Aliens". Riga, Latvia. 2015 Emerging exhibit at the Annenberg Space for Photography, L.A. U.S.A.
2013 Tbilisi Photo Festival. Georgia. 2012 Group Exhibition, Georgian Culture Gallery. Tbilisi, Georgia. 2011 PDN Emerging, Ring Cube Gallery. Tokyo, Japan. 2011 L.A.F. Project, NAPA Gallery. Prague. Czech Republic. 2011 L.A.F. Project, Anglo-American University's gallery Art Space. Prague, Czech Republic. 2010 Group Exhibition at Gallery TBC. Bank of Georgia, Tbilisi. 2010 “Kolga” Winner at Gallery Pilarmonia, Tbilisi, Georgia. 2008 Finalists for Photo week DC. Washington D.C. U.S.A.
2008 “Kolga” Winner at Gallery Karvasla, Tbilisi, Georgia. 2006 ICP, School of International Center of Photography Gallery. New York, U.S.A.
2006 ‘Circle of Arts’ at the Jan Hus Presbyterian Church. New York City, U.S.A.
2005 Group Exhibition at Café “Raindi”. Tbilisi, Georgia. 2004 Group Exhibition at Goethe University Gallery. Tbilisi, Georgia. 2003 Group Exhibition at Gallery Hobby. Tbilisi, Georgia. 2002 Photo Competition “Kolga” group Exhibition at the N Gallery, Tbilisi, Georgia. 2003 Photojournalism Contest at the State Public Library, Tbilisi, Georgia. 2000, 2001 Sepia Studio Gallery. Tbilisi, Georgia. 2000 Photo Competition “Kolga” finalists at the Vernisage Gallery, Tbilisi, Georgia.